Mouse Pad:No more slipping and sliding on your desk. Enough space to fit mouse, keyboard, tablet and different size laptop devices. 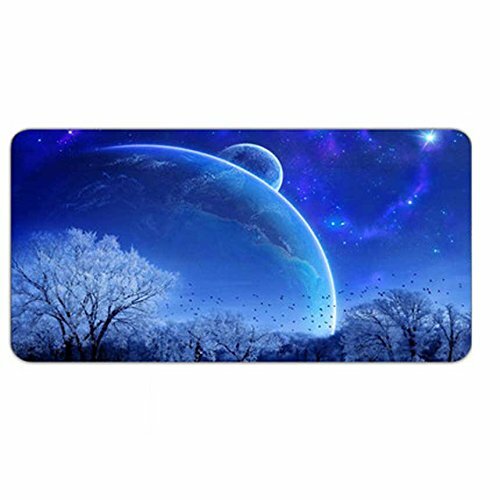 this mouse desk pad is the best choice as a gift for men, women, children, teens, friends, family and others. Soft-feeling Material and Stable Quality: Made of high quality material which provides comfortable user experience. The latest anti-fraying edge stitching makes to ensure the desk mousepad does not fray or craze for a long time use. ANTI-SLIP: microfiber weave surface and anti-slip rubber bottom finished. If happen to spill anything on it or other accidents, it is washable and make the mouse pad no slipping and movement on the desk or table. ECO-FRIENDLY, NON-TOXIC, AND RISK-FREE - The extended mouse pad is made of high quality Eco-friendly material. We guarantee our product with high-level quality. Just contact us when you have any issues or questions. Backed by a guarantee that you are fully satisfied with our product or receive your money back. In kind prevail, thank you for your understanding.